So what else do you do on a winter’s morning in New York? I have been in the city for work for the last few days and saw that the New York Road Runners were holding one of their five annual Half Marathons. 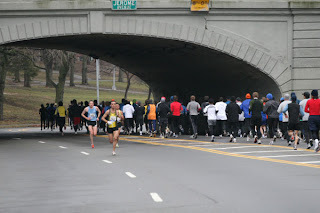 (They run one in each of the Boroughs as well as organising the New York Marathon itself.) So I paid my $30 and turned up at 8:00am on Sunday morning at Lehmann College in The Bronx to do my Sunday morning long run with a few other people. It was terrific fun. Snow had been forecast, but luckily it didn’t arrive until the afternoon. Instead we just had a fairly biting wind and a certain amount of cloud, broken up by sunshine. On the photo you can actually see me. I’m the one in yellow, running away from the camera. No, it really is me… Honestly.